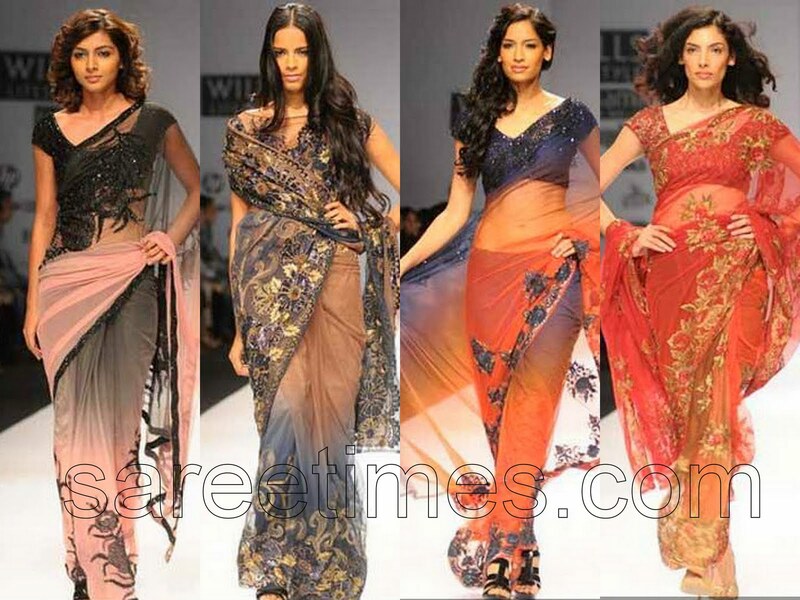 Models in designer half sarees on the ramp. 1. Raima Sen in beautiful pink and blue embroidered lehenga with pink georgette dupatta and contrast cream color short sleeves blouse with pink embroidery. 2. 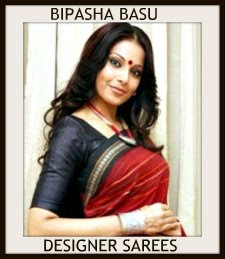 Model displaying all time favorite combination black and red half saree designed by Swapna and Seema at Wills Fashion Week 2010. The lehenga and dupatta are finished in perfection with the sleeveless blouse. 3. 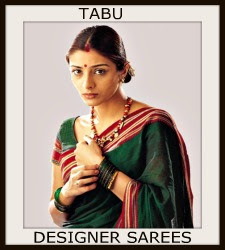 Model in rust color half saree designed by ace designer Satya Paul. Broad 4 inch patchwork border and small zari border highlight the lehenga. 4. 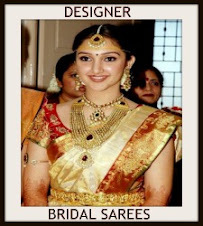 Model in bridal white and beige half saree designed by Bhairavi-Jaikishan. Embellished with lace and embroidery in self. 5. Beautiful white color half saree designed by Priya. 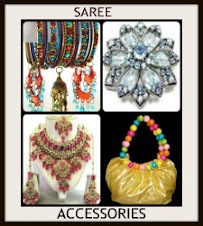 Paired with multicolor dupatta and cap sleeves blouse. Model displaying beautiful purple designer transparent saree. 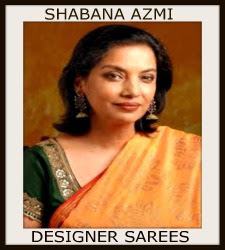 The saree border is highlighted with silver floral motifs work paired with designer cap sleeves saree blouse for back with ‘V’shape neck pattern and sparkling zardosi work from designer Swapan and Seema at Wills India Fashion Week 2011. 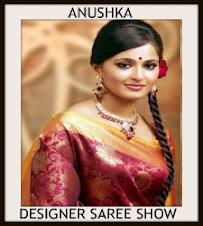 Model displaying designer gorgeous saree with zardosi work paired with designer short sleeves saree blouse fron designer Swapan and Seema at on Day Five of Wills India Fashion Week 2011. Model displaying beautiful purple designer shimmer saree with floral motifs,fabrics and maroon border work paired with designer collared sleeves saree blouse with sparkling zardosi work from designer Swapan and Seema at Wills India Fashion Week 2011. Model walks in beautiful black designer net saree with sequins buttes,sparkling zardosi and regal fabrics and gold embroidered lace border work paired with designer cap sleeves saree blouse for back with round neck pattern and sparkling zardosi work from designer Swapan and Seema at on day Five of Wills India Fashion Week 2011. Model displaying beautiful deep purple designer plain drape saree with fabrics work paired with designer short sleeves saree blouse with round neck pattern from designer Swapan and Seema at Wills India Fashion Week 2011.It is a chiffon saree. Model displaying beautiful maroon designer embroidery bridal drape saree with studs,sequins buttes,fabrics,sparkling fabrics and gold lace border work paired with designer embroidery short sleeves saree blouse for back with round neck pattern from designer Swapan and Seema at on day Five of Wills India Fashion Week 2011. 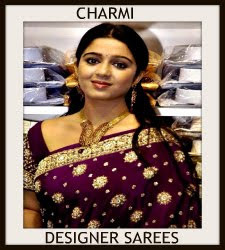 Model displaying beautiful deep purple designer embroidery plain saree with sparkling zardosi and fabrics work paired with designer sleeveless saree blouse for back with square neck pattern from designer Swapan and Seema at Wills India Fashion Week 2011. Model walks in beautiful maroon designer embroidery shimmer saree with floral motifs,regal fabrics, glamorous details, zardosi and embroidered border work paired with designer backless cap sleeves saree blouse with gold border from designer Swapan and Seema at Wills India Fashion Week 2011. 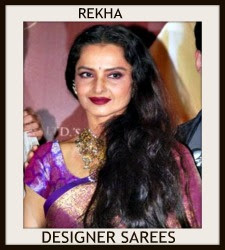 Model displaying deep purple designer transparent saree with embroidered,floral motifs,metallic Finishes,sparkling zardosi work paired with designer short sleeves saree blouse with round neck and fabric work designer for back from designer Swapan and Seema at on day 5 of Wills India Fashion Week 2011. Model displaying beautiful mushroom grey designer embroidery shimmer saree with beautiful regal fabrics,floral motifs and lace border work paired with designer short sleeves saree blouse with floral motifs and round neck pattern for back from designer Swapan and Seema at Wills India Fashion Week 2011. 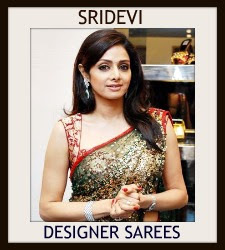 Model displaying beautiful cherry red designer embroidery plain drape saree with sparkling zardosi work paired with designer cap sleeves saree blouse for back with ‘V’shape neck pattern from designer Swapan and Seema on Day Five of Wills India Fashion Week 2011. Model walks in beautiful blue designer shimmer saree. 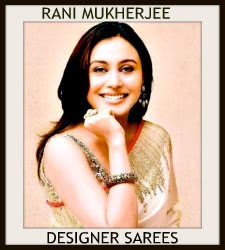 The border is decorated with beautiful saturated hues,floral motifs and gold lace border work paired with designer saree blouse with ‘V’shape neck pattern from designer Swapan and Seema at Wills India Fashion Week 2011. 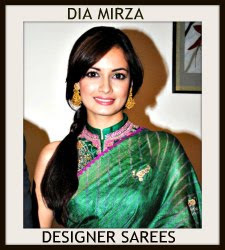 Model displaying beautiful black designer embroidery chiffon drape saree with sparkling zardosi,floral motifs,mirror and border work paired with designer embroidered cap sleeves saree blouse for back with round neck pattern from designer Swapan and Seema at Wills India Fashion Week 2011. Models displaying Swapna and Seema Sari collection. 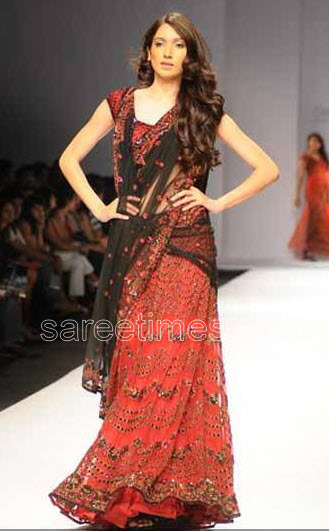 Model displaying beautifully embellished designer half saree with enticing combination from Swapna and Seema at Wills Fashion Week 2010. 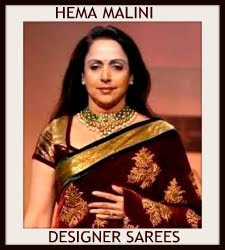 Check out Swapna and Seema creation at Wills Fashion Week 2010.